"Accidental recipes are the best and this one is no exception! This is a fancy vegetarian-lover's way to spice up squash without losing the smooth, subtle squash flavor." Wrap each squash half with plastic wrap. Place wrapped squash, cut side down, in microwave; cook on high until squash is tender, 12 to 15 minutes. Leave squash wrapped while preparing filling. Heat olive oil in a large skillet over medium heat; cook and stir red bell pepper, radish, leek, celery, jalapeno pepper, and garlic in the hot oil until softened, about 10 minutes. Add vegetable stock and rice; stir to combine. Cover and simmer until broth is absorbed and rice is tender, about 45 minutes. Sprinkle greens into rice mixture; cover and simmer until greens are wilted, about 5 minutes. Add curry powder, curry paste, and walnuts to rice mixture; stir to combine. Unwrap squash and set halves, cut sides up, into 4 soup bowls. 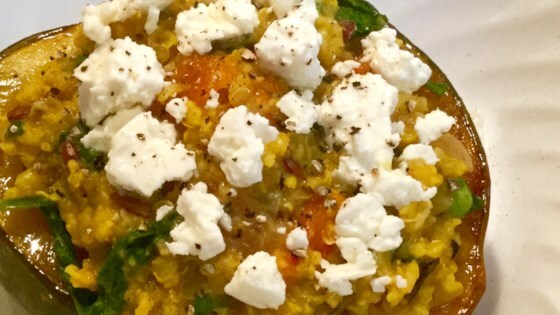 Spoon about 2 tablespoons feta cheese into each squash half. Add a large scoop of rice mixture atop feta layer. Top rice mixture layer with any leftover feta. This was very good. Cheese really added to the flavor. Thanks for great tasting healthy recipe. This was a delicious vegetarian dish! This was excellent! I followed very close only did not have brown rice so used half white and half wild.